How many times in a day do you hear your kids say, “Mommy, I’m bored!”Enough to make you look for ways to keep them busy during the summer afternoons, right? 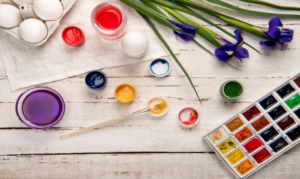 Here are some simple arts and craft activities for you and your kids to enjoy. If you thought bath bombs could only be enjoyed by women, then you got it wrong. Kids love to see round colorful balls turning into a fizzy bath. These bath bombs are simple to make and your kids would love to add their science knowledge into it. Mix the baking soda, citric acid, cornstarch and Epsom salt in a dry bowl. Combine the dry components well and set it aside. Take another bowl, add water, olive oil and drops of essential oil, and mix well. Now add the dry mixture into the oil mixture and mix them thoroughly. Set the bowl aside for few minutes. If the mixture looks too dry, add two drops of olive oil. Divide the mixture into smaller bowls, add few drops of food coloring in each, and mix well. Lastly, take a mould and pour in the mixture of one color first, layering it over with mixture of another color. Fill in two halves of the mould tightly and let the mixture get dry in it for a while. After a few minutes, turn the mould upside down and let the ball dry over night. After drying for 24 hours, they will be ready to use. Your kids would love the wobbly chicken bobble heads dyed in their favorite colors. Moreover, they make cute knick-knacks for your shelves. Take the polymer clay and make two small balls out of it, which would make the head and the body of chicken. Keep the head smaller than the body. Take another glob of clay and make tail and wings of the chicken. With a toothpick, make feather marks on the wings and tail. Press them on to the body. Take the glass beads and insert them in place of eyes. Then take yellow or any bright color of clay to make beak out of it and insert it on the head ball. For the last part, take 2 inches of gauge wire and wrap it around the pencil or the chopstick, keeping the ends of the wire straight. Remove the pencil from the wire coil and insert one end of the spring in the head of the chicken and one heading the body, joining the two balls together. Now bake the clay according to instructions specified on the clay package. Your chicken will be ready to bobble in no time! Watercolors infused with salt water can be used to make beautiful and unique patterns, making each painting unique with no same design. You can make salt water wrapping sheets with your kids, and wrap them around flowerpots, vase, or use them as origami sheets to make hangings. Lay down the paper sheet and wet it with water either by water spray or by stroking a paintbrush with water over it. Now dip the brush in the color of your choice and stroke it over the wet surface. Divide the paper sheet into two parts and sprinkle Epsom salt on one side and sea salt on one. Let the sheet dry. Once the sheet has dried, brush off the salt – you will see beautifully lined patterns formed underneath the salt.